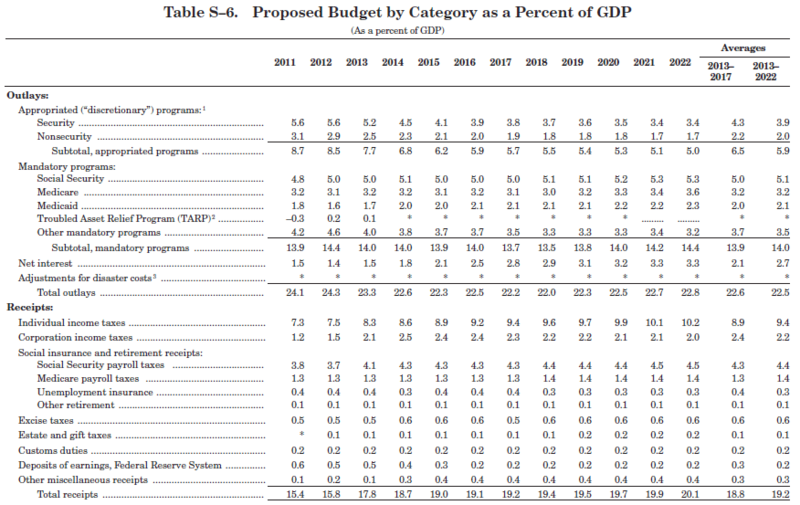 Much of what you’ve been reading about the Obama budget proposal is dead wrong. I’ve already noted in a post that next year’s outlays for defense, Social Security, Medicare, and Medicaid will outpace total tax receipts. In a great column today — Obama’s budget guts the government — Washington Post columnist Robert Samuelson points out that the increasing spending on entitlement programs like Social Security and Medicare will simply crowd out much other government spending. Social Security, Medicare and Medicaid — boosted by the aging baby boom and high health costs — are relentlessly determining national priorities. Neither Republicans nor Democrats want to discuss this openly. At a press briefing, top administration officials — led by Gene Sperling, head of the National Economic Council, and Jeffrey Zients, acting head of the Office of Management and Budget — barely mentioned these programs. That’s some feat, considering they constitute 44 percent of non-interest spending and are projected to account for 57 percent by 2022. The paradox is obvious, if unspoken: An avowedly liberal administration is gutting government because it lacks the political will to confront programs for the elderly. So total federal outlays were 24.1% of GDP in 2011, but will be 22.8% of GDP in 2022 (hitting a low of 22.0% along the way). But three mandatory programs — Social Security, Medicare, and Medicaid — that comprise 9.8% of GDP in 2011 will increase to 11.2% of GDP in 2022. That means the rest of the federal government will contract as a share of the total economy — security spending will go from 5.6% of GDP in 2011 to 3.4% of GDP in 2022, for example. Other discretionary spending (things like the National Parks, the CDC, NASA, and on and on) would fall from 3.1% of GDP in 2011 to 1.7% of GDP in 2022. Adjusting the data for inflation and population, we end up with a reduction in all discretionary spending from $1.261 trillion in 2013 to $989 billion in 2021, while mandatory programs (almost entirely dominated by Social Security, Medicare, and Medicaid) increase from $2.293 trillion in 2013 to $2.803 trillion in 2022. Granted, none of the political choices (limits on Social Security and Medicare benefits, deep discretionary spending cuts, much higher taxes or large deficits) is appealing to either party. But instead of a real debate on the size and role of government — which programs are important, which are ineffective, who deserves benefits, what’s a tolerable level of taxation — we are making choices by omission in a way that exempts the elderly. All budgetary pressures are being concentrated on (a) the dwindling portion of spending not devoted to the elderly and (b) higher taxes. This is a formula for governmental failure and generational unfairness. It’s a big story. Someone should pay it heed.